Tuscaloosa. — Artist Karl Haendel will give a public lecture on Thursday, April 12, 2018, at 6:30 p.m. in 205 Smith Hall, on UA campus. Haendel makes drawings, installations, films and public projects in Los Angeles where he lives and works. He received a bachelor’s degree in art semiotics and art history from Brown University and an MFA from the University of California, Los Angeles. Haendel also studied at the Whitney Museum Independent Study Program and the Skowhegan School of Painting and Sculpture. Articles and reviews about his work have been featured in The New York Times, the Los Angeles Times and The Guardian and in magazines including The New Yorker, Artforum, Frieze, Art and America and Modern Painters. Haendel has been included in the Biennial of the Americas (2015), the Whitney Biennial (2014), Biennale de Lyon (2013), Prospect (2011), and the California Biennial (2004, 2008). His work is in the collections of the Museum of Modern Art, NY; the Whitney Museum of American Art; the Guggenheim Museum, NY; the Museum of Contemporary Art, Los Angeles; the Hammer Museum, Los Angeles; the Fogg Art Museum; Kunsthalle Bielefeld, Germany and the Astrup Fearnley Museum of Modern Art in Oslo. He has been the recipient of grants from the Pollock Krasner Foundation and the California Community Foundation and is represented by Susanne Vielmetter Los Angeles Projects; Mitchell-Innes & Nash, NY; Wentrup, Berlin and Barbara Seiler, Zurich. 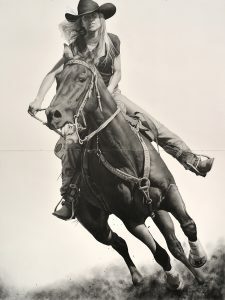 Image Credit: Karl Haendel, Rodeo 9, 2017, pencil and graphite powder on paper, 103 x 77 inches. Image courtesy of the artist. Karl Haendel’s lecture is part of the Visiting Artist and Scholar Lecture Series, sponsored by the Department of Art and Art History, the Visiting Artist and Scholar Committee, the College of Arts and Sciences and the College of Continuing Studies at The University of Alabama. To see our past and future visiting artists and scholars, click here. 205 Smith Hall, at 427 Sixth Avenue, Tuscaloosa, is a four-minute walk from the Campus Drive Parking Deck and Bus Hub on Hackberry Lane. Information about visitor parking is available here: http://bamaparking.ua.edu/visitor-information/. Parking is free on campus in a legal space after business hours.